Sadly, the most popular and highlighted segment in Cambodia’s history is neither a national achievement nor historical feat: it is the horrendous, inhumane regime of the Khmer Rouge and its supreme leader, Pol Pot. This group executed millions of innocent Cambodians, including their own relatives, friends, and neighbors, including women, the elderly and children. Many of their gory and bloody acts against humanity are too vicious to even mention. Today, the Tuol Sleng Genocide Museum is an eerie reminder of this dark history not only of Cambodia but of all humanity. 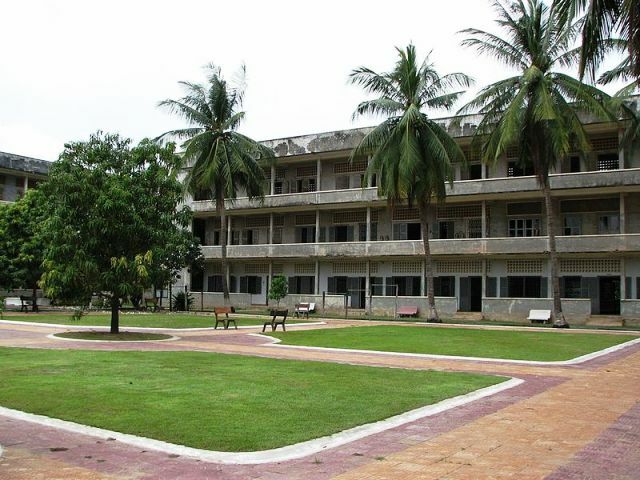 Tuol Sleng in Khmer means “Hill of the Poisonous Trees”. The museum stands today so that the bloody acts of yesteryears should never happen again. Below is a brief historical account on how the museum came about. Phnom Penh is a tiny, developing city in Southeast Asia, and touring this capital city of Cambodia from end to end is possible in a day. The most crowded area in the city is the Sisowath Quay, a 3-km-long walk along the Phnom Penh riverside where tourists regularly go to shop, eat, drink, meet people, and simply enjoy the scenery. All roads leading to Phnom Penh’s major landmarks and destinations converge at Sisowath Quay. This promenade along Tonle Sap River is flanked by rows of luxury hotels, major restaurants, bars, cafes and interesting shops. 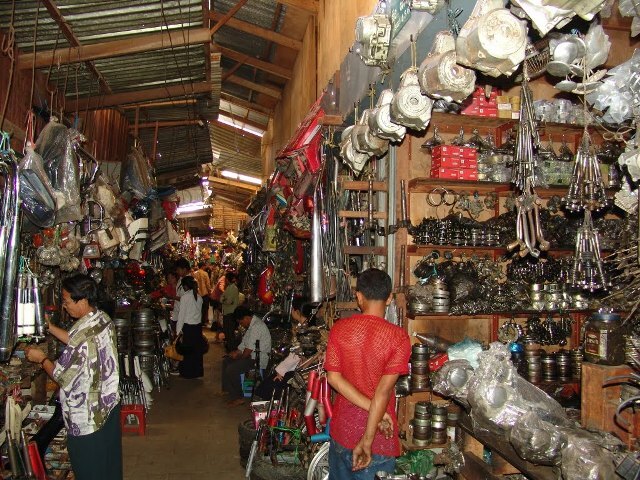 It is always full of vendors, tourists and expats, as well as locals. A common sight includes a number of Western tourists huddling over pitchers of cold beer while chatting the afternoon away. The real name of this important market in Phnom Penh is Psar Toul Tom Poung, but it’s been called Russian Market since the 1980’s. No, the Russians did not build it, but the name caught on because the market used to sell tons of Russian goods during the Cold War. Today, modern trinkets and souvenir items have replaced any traces of Russian items on sale. Although tiny and still on the road to development, Phnom Penh is a well-visited tourist city in Southeast Asia known for its many unique, exotic and cultural tourist attractions. A popular spot for foreign tourists and expats is the 3-km long promenade called Sisowath Quay, situated along the river. 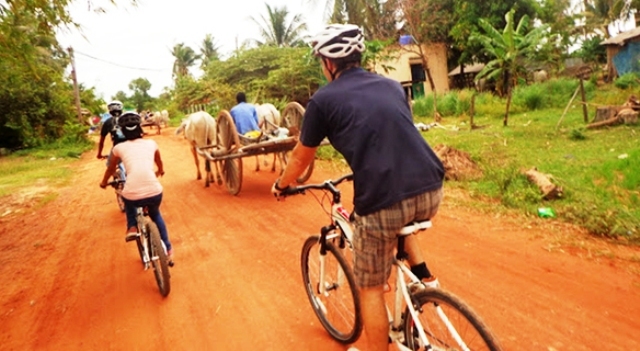 It is one of the many reasons why bicycle touring in Phnom Penh is a wonderful way of seeing and experiencing the city. 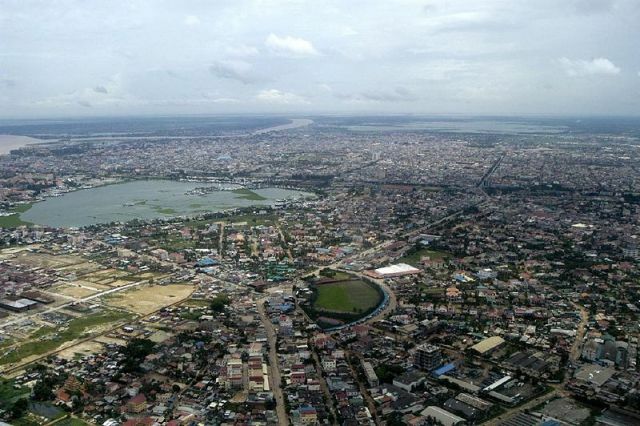 Phnom Penh is the capital city of Cambodia. Along with the entire country, this city strives to completely get away from its dark history marred with wars and internal conflicts, and into becoming one of the leading mega-cities in Southeast Asia. Poverty is quite apparent in Phnom Penh, which explains the presence of so many international humanitarian foundations and non-government organizations. 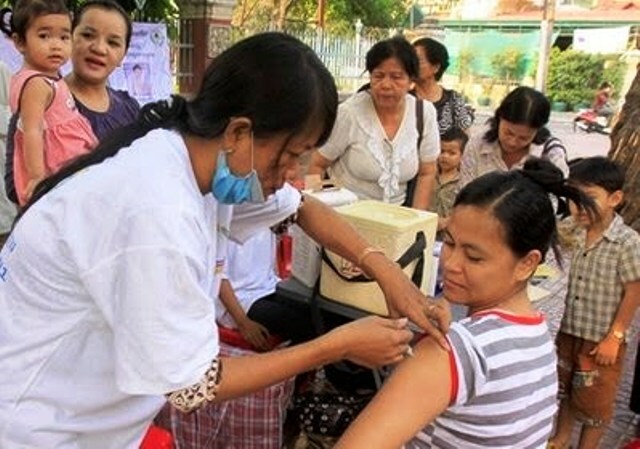 Visiting tourists are often concerned about their health in Phnom Penh and for good reasons. Modern Cambodia is still hounded by its gory past. People around the world easily associate the capital city of Phnom Penh with the Khmer Rouge, whose mere mention of the name could send shrills to one’s spine, especially to those who personally experienced their violence. But the past is past. Today, Phnom Penh is bustling with tourism and modern industries. It is a very inviting and warm city, literally. 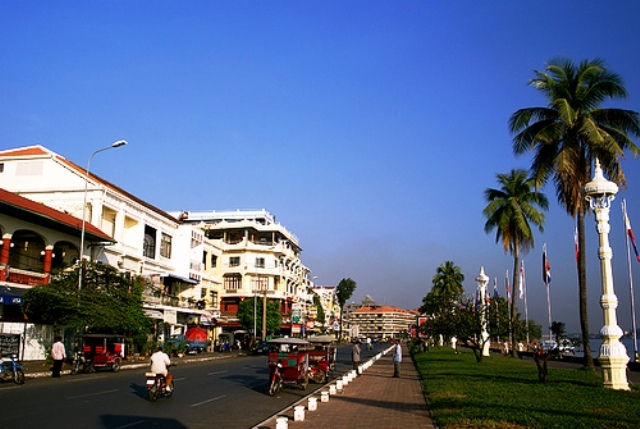 Weather in Phnom Penh is generally warm and humid, experiencing tropical climate all year round. It is hot the entire year, but November to January is slightly cooler.